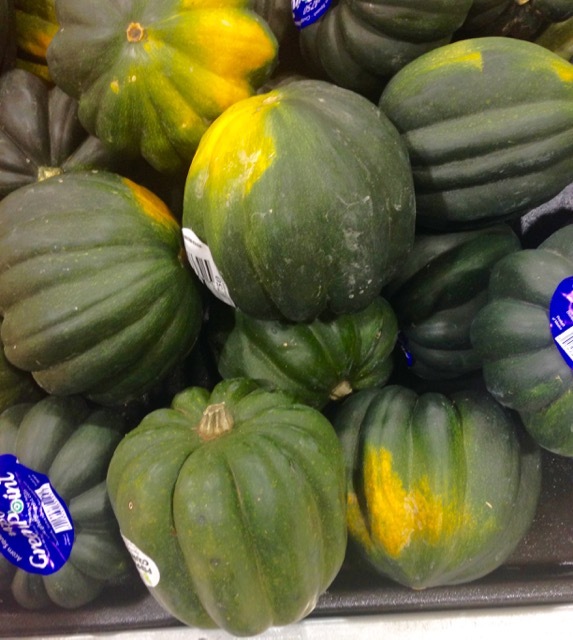 Acorn squash is a small acorn shaped winter squash that tapers at the apex. It can weigh up to 1kg (2.2Ib) and measures about 6-inches long. It has a smooth hard rind with deep ridges that make peeling it very difficult. The colour of the skin (rind) is variable depending on the variety. It can be dark green with orange/yellow markings, or orange or white or variously variegated. A cup (7oz; 200g) of baked acorn has about 100 calories and gives 90mg (11%) RDA of calcium. (The Wellness Encyclopedia of Food and Nutrition). Acorns do not contain much beta carotene like other winter squashes. They are a good source of calcium. A small acorn squash can serve one person and a bigger one two people. To cook acorn squash, it’s best to halve it, remove the seeds, then season with salt, herbs and spices; or brown sugar, maple syrup or honey or just butter and bake at 400ºF (200ºC)for about 45-60 minutes or until fully cooked through. You can also stuff the halves before baking. Another way is to cut out the stem end and scoop out the seeds and then stuff it and bake it whole. 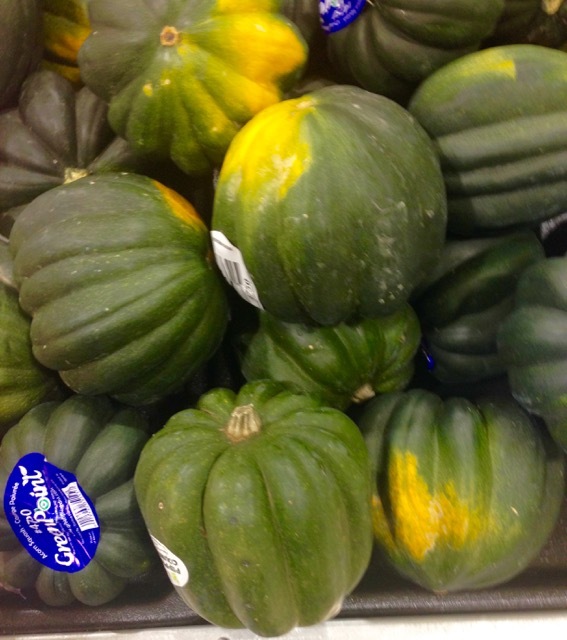 Acorn squash can also be steamed or boiled. Here is the link to the recipe. I hope you enjoy making it. The ‘Golden Acorn’ cultivar is a glowing pumpkin colour. Winter squashes have a long shelf life. Uncut acorn squash can keep for 3 months or longer in a cool, dry place. Storage below 50ºF (10ºC) in the fridge will cause squash to deteriorate faster. It can only be stored in the fridge for one to two weeks. Once the squash is cut wrap it tightly with cling film and store for up to one week in the fridge. Acorn is one of the few squash that I’ve never tried. I must cook one soon as I’ve never found a vegetable that I didn’t like. I am planning to make some in the new year. I can’t wait!!! OMG Squash is like my FAVORITE vegetable!! I bake my at high heat, seasoned with salt and pepper and it is always sooo good!! Me too! I have several that I plan to cook over Christmas…with honey or maple syrup and lots of butter…yum! I have one I need to bake. I got some sausage to stuff it with. Happy baking. Mine was a hit….maple syrup and butter…so good! I love acorn squash, Liz. It’s one of my favorite winter vegetables that I roast and then mash with butter and cinnamon. Comfort food for the soul! Ha ha I’m cooking some tonight. With maple syrup and butter. I can’t wait to dig in and enjoy. Have a lovely weekend.